The one thing that I have had the hardest time trying to organize is paper clutter. It’s seriously been the worst, especially without having an entryway and a place to drop the mail. But I finally found a good system that works for me and I’m so excited to share! This pretty pink paper box I got from Staples for around $5. I love the pink color and it was just what I needed to get everything together. The box itself only has 3 separate sections, and I knew I was going to need something else to separate all the different categories of paper I have. So, I went to the promised land–Target–and got these adorable file folders only 3 for $1! Whoot whoot! 1. In the front, I keep two file folders: One for “action” items and one labeled “file.” The “action” folder is for papers that I need to take action on, such as call, schedule, a bill I have to pay, etc. Once a week or once every two weeks I will sit down and tackle whatever is in this folder. In many cases, the papers from “action” will get moved to the “file” folder, where I’ll put paper that needs to end up in my files–obviously. About once every two weeks or once a month I’ll pull out that folder, bring it over to my filing box and go to work. 2. The second section hold things I use most frequently, like my planner stickers, blog planning sheets, and labels. Planner stickers I use once a week on Sunday when I’m setting up my planner for the week (you can see how I decorate my planner by following me on Instagram @lifeinorder–or if you want to see a planner post, let me know!). The labels folder holds chalkboard labels, flags, etc. I use these things when I need to label something quickly, and sometimes I use them in my planner as well. They’re good to have on hand in an easily accessible place. My monthly blog planning sheets are essentially just calendars that I plan all my blog posts out on for the month before I transfer the final editorial calendar into my planner. 3. In the very back, I keep an accordion file with coupons–so nice for when Ulta, American Eagle or Victoria’s Secret coupons come in the mail. I just open them up and drop them into the accordion file. When I go shopping, I grab the whole folder, put it in my bag and go. I also keep the Welcome packet to our apartment complex for emergencies, an extra notepad, and my extra Freedom Filer tabs. The key to making this system work is maintenance. Sort through the mail the second you walk through the door. It’s so key because if you let the paper settle somewhere else, it’s going to create clutter. Put it in the garbage or in the right file, don’t just set it down on the table, or it will stay there cluttering your life, and ultimately, your mind. Don’t be a victim to dreaded paper clutter! Try setting up a mail system that works for you, don’t settle for throwing your papers on the kitchen table–you’re better than that! You’re reading my blog all about organizing, so you’re already thinking about it. Now is the time to do it! I hope I’ve inspired you to tackle paper clutter around your house. 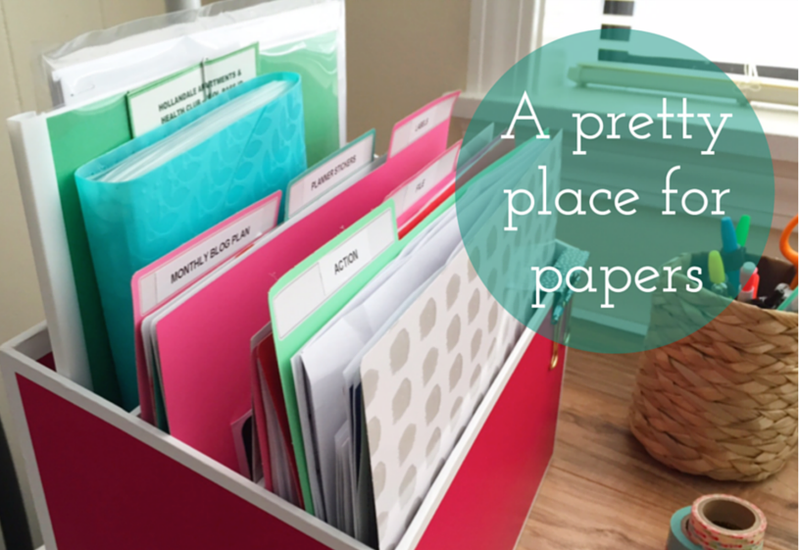 Do you have any ways you organize paper clutter that work for you? Please share them with me in the comments! I’m alway looking for new ideas, especially when it comes to getting Matt on board with clearing his paper clutter. If you’re interested in more creative, organized spaces, places and inspiration, follow me on Instagram, @LifeInOrder or on Twitter at @LifeInOrderBlog. Don’t forget to subscribe in the right sidebar or follow me on bloglovin’! Until next time!